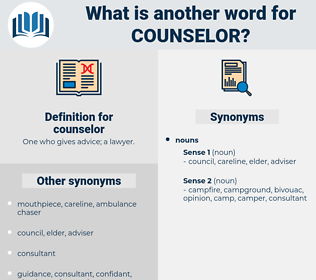 What is another word for counselor? One who gives advice; a lawyer. counsel, councillor, councillors, consultant, Consultants, chancellor, master. 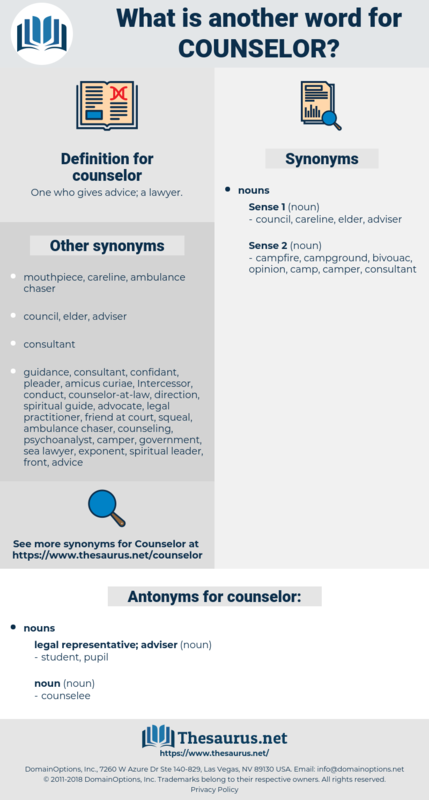 counsels, counsel, therapist, counseling, supervisor, instructor, councillor, consultant, chancellor, tutor, attorney, prosecutor, colleague, psychiatrist, master, aide. He was neither the courtier nor the counselor. William Law, Joseph's second counselor, William Marks, president of the Nauvoo Stake, with many other leading men proved themselves false to Joseph and the Church. chancellery, chancellor, Cygnus Olor, consular, canonical hour, canicular, counsellor, councillor, Councilor, Chinese Celery.